Enjoy the classic Italian flavors of pesto, sun-dried tomatoes, and lemon zest in this linguine recipe. You'll never believe it's such a healthy pasta dish! 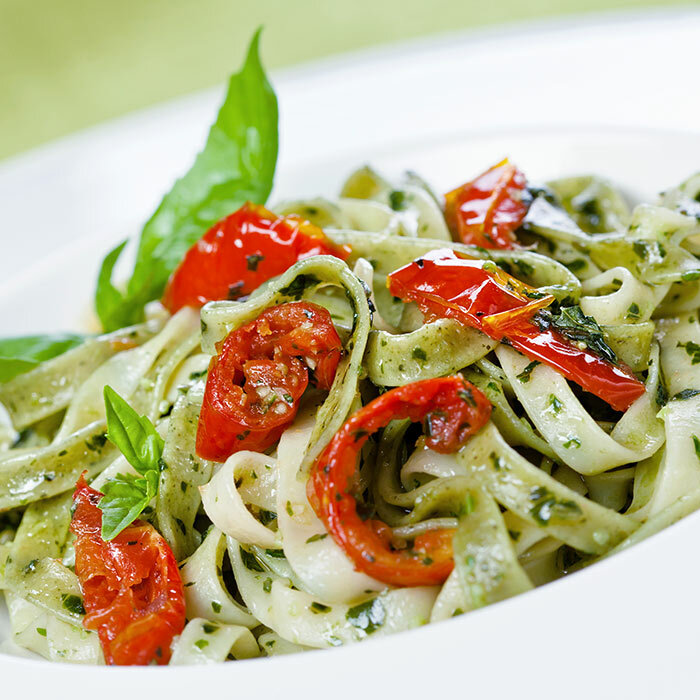 To make the pesto, combine basil, garlic, pine nuts, and 3 tablespoons oil in the work bowl of a food processor. Pulse until mixture forms a chunky-smooth paste, scraping down sides of work bowl as necessary. Season with salt and pepper. Bring a large pot of water to a boil. Add linguine; cook 4 minutes. Add snow peas; cook 3 more minutes. While linguine cooks, heat remaining oil in a medium skillet over medium. Saute onion, tomatoes, and olives for about 6 minutes or until onions are translucent. Drain linguine and return to cooking pot; stir in pesto. Divide linguine among 6 plates. Top each with an even portion of the sun-dried tomato mixture and lemon zest and serve. Recipe courtesy of RANCHO LA PUERTA in Tecate, Mexico.